Picture the scene: you’re in the world’s most hipster coffee house. Everyone except you has a beautiful, floral neck tattoo. An array of pristine, colourful and quirky pastry goods are set out in front of you as you queue up to make your order. You know you like the plain cinnamon doughnut: you tried it one before and it was perhaps the best you’ve ever tasted in your life. But – oh! – how beautiful these others look. There’s novelty confectionary-heaps on top of each of them. Colour swirls here, glitter there. 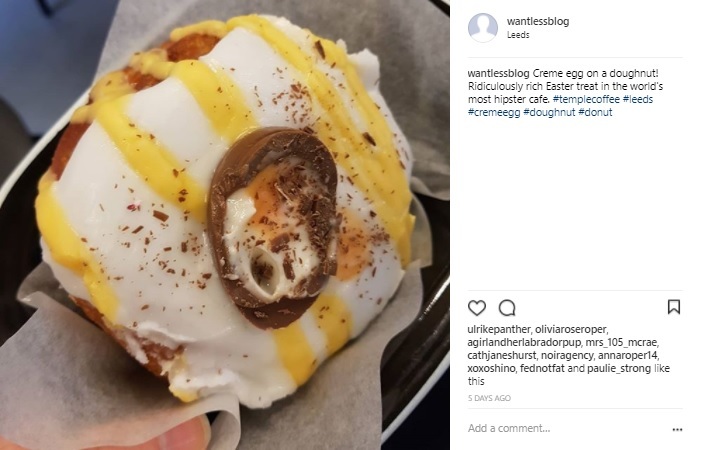 You plump for an icing-smothered doughnut with half a Creme Egg on top of it, because…well, it’s just so Instagrammable. And you take the picture. You post it. You bite into the pastry with a sense of satisfaction, then realise that of course, it’s far too sugary. You should have gone for the plain one that would look like a dried camel turd on pictures but tastes…perfect. So, yes, anyone looking at my Instagram account will realise that this scenario is not exactly a random figment of my imagination. Before I go any further, I want to say that railing against the imaginary ‘perfect lives’ people post on Instagram feels really old-hat. I do think that there’s a lot of hysteria about people wanting to put a bit of gloss on the photos they send into the world. I, personally, love pretty pictures. I love looking at beautiful travel snaps, nice interiors and cute puppies. AND I DON’T CARE. We also want to put these things out in the world, when we’re sharing our own photos. We all want to appear creative, well-travelled and stylish. Of course we do. But the problem comes when the Instagram tail starts wagging the living-your-life dog. I don’t particularly want to become one of those people who takes it all too far and just posts sickeningly smug pictures on my feed. So my fourth monthly challenge will see me deliberately doing the opposite. Every day, I will post a photo on Instagram of something in my life that is mundane, disappointing, imperfect or embarrassing. Something I’d never usually want to post. Not to complain about it, but just as a reminder that the monotony of life makes up 98 per cent of our existence. It can still be marvellous in its own unremarkable little way. I will call my April challenge Hashtag Underwhelming.